All products include a ninety (90) day hardware warranty starting the date the product is delivered. Please keep all packaging. Customers can contact our Customer Service team by starting a Support Ticket. Tickets are answered in the order received. Order cancellation requests must be made prior to shipment. Once a tracking number has been generated, a $25 intercept fee will apply for cancellation requests. For security reasons, we are unable to change shipping addresses for any reason. Returns may only be requested within fourteen (14) days of delivery. The customer is responsible for return shipping. We issue a refund less original shipping upon return and inspection. Refunds are processed within three (3) business days of return. Alternatively, a store credit can be requested by customers planning to order a replacement. 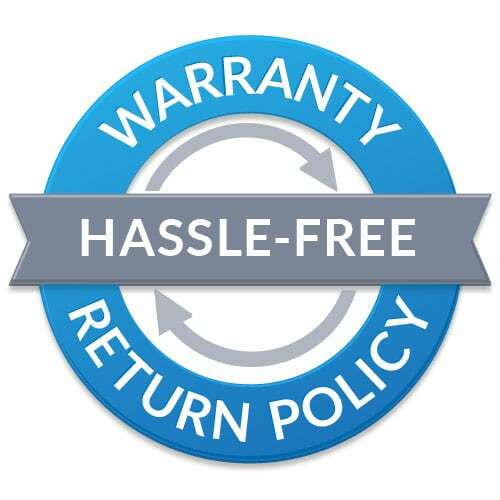 If a repair is requested due to a hardware failure within ninety (90) days of delivery, the customer is responsible for return shipping unless an Extended Warranty is purchased. We will attempt to repair the issue; if non-repairable we will issue either an exact replacement or a store credit equaling the full price of the product at the present time. Service is normally completed within three (3) business days of delivery. Learn more about the benefits of buying a Warranty from Mac Of All Trades. We offer One (1) Year and Two (2) Year Extended Warranties which can be purchased anytime within the ninety (90) day hardware warranty period. The extended warranty period will begin the date the product is delivered regardless of when the warranty is purchased. In the rare event of a hardware failure, the customer receives a prepaid shipping label to return the product for warranty service. Consumable parts such as batteries and media drives are not covered by our warranties. Products that have suffered damage (e.g., abuse, accidents, misuse) are not eligible for return or service. Factory sealed products are subject to a 15% restocking fee once opened, if returned. All products have a thirty (30) day return policy starting the date the product is delivered. Please keep all packaging for the duration. Customers may request a return by starting a Support Ticket. Tickets are answered in the order received within one (1) business day. Instructions will be provided in English. If a return is requested within thirty (30) days of delivery, the customer is responsible for return shipping. We issue a refund of the purchase price less a 15% restocking fee. In the rare event of a hardware issue, the restocking fee is waived. Refunds are processed within three (3) business days of delivery and inspection. Customers may purchase a replacement by placing another order from our website. Products are not eligible for return after thirty (30) days from delivery. Products determined as defective due to physical damage, liquid damage, or power surge are not eligible for return. Software issues do not constitute a defect in the product itself. WARRANTIES APPLY ONLY TO HARDWARE PRODUCTS PURCHASED FROM MAC OF ALL TRADES (MOAT) THAT CAN BE IDENTIFIED BY THE SERIAL NUMBER ON FILE. MOAT IS NOT LIABLE FOR ANY DAMAGE TO OR LOSS OF ANY PROGRAMS, DATA, OR OTHER INFORMATION STORED ON ANY MEDIA, OR ANY NON-APPLE PRODUCT OR PART NOT COVERED BY THIS WARRANTY. RECOVERY AND REINSTALLATION OF SYSTEM AND APPLICATION SOFTWARE AND USER DATA ARE NOT COVERED UNDER WARRANTY. THIS WARRANTY DOES NOT APPLY: (A) TO DAMAGE CAUSED BY ACCIDENT, ABUSE, MISUSE, MISAPPLICATION, OR PERIPHERALS; (B) TO DAMAGE CAUSED BY SERVICE PERFORMED BY ANYONE NOT APPROVED BY MOAT, OR (C) IF ANY APPLE SERIAL NUMBER HAS BEEN REMOVED OR DEFACED. THESE WARRANTIES AND REMEDIES SET FORTH ABOVE ARE EXCLUSIVE AND IN LIEU OF ALL OTHER WARRANTIES, REMEDIES AND CONDITIONS, WHETHER ORAL OR WRITTEN, EXPRESS OR IMPLIED. MOAT SPECIFICALLY DISCLAIMS ANY AND ALL IMPLIED WARRANTIES, INCLUDING, WITHOUT LIMITATION, WARRANTIES OF MERCHANTABILITY AND FITNESS FOR A PARTICULAR PURPOSE. IF MOAT CANNOT LAWFULLY DISCLAIM IMPLIED WARRANTIES UNDER THESE WARRANTIES, ALL SUCH WARRANTIES, INCLUDING WARRANTIES OF MERCHANTABILITY AND FITNESS FOR A PARTICULAR PURPOSE ARE LIMITED IN DURATION TO THE DURATION OF THIS WARRANTY. TO THE MAXIMUM EXTENT PERMITTED BY LAW, MOAT, WILL UNDER NO CIRCUMSTANCES BE LIABLE FOR ANY SPECIAL, INDIRECT, INCIDENTAL OR CONSEQUENTIAL DAMAGES RESULTING FROM PERFORMANCE OF ANY REPAIR SERVICES, INCLUDING BUT NOT LIMITED TO LOSS OF REVENUE; LOSS OF ACTUAL OR ANTICIPATED PROFITS (INCLUDING LOSS OF PROFITS ON CONTRACTS); LOSS OF THE USE OF MONEY; LOSS OF ANTICIPATED SAVINGS; LOSS OF BUSINESS; LOSS OF OPPORTUNITY; LOSS OF GOODWILL; LOSS OF REPUTATION; LOSS OF, DAMAGE TO, OR CORRUPTION OF DATA; OR ANY COSTS OF RECOVERING, PROGRAMMING, OR RESTORING ANY PROGRAM OR DATA STORED OR USED WITH YOUR PRODUCT AND ANY FAILURE TO MAINTAIN THE CONFIDENTIALITY OF DATA STORED ON YOUR PRODUCT. MOAT SPECIFICALLY DOES NOT WARRANT THAT IT WILL BE ABLE TO (A) REPAIR OR REPLACE YOUR PRODUCT WITHOUT RISK TO OR LOSS OF PROGRAMS OR DATA, AND (B) MAINTAIN THE CONFIDENTIALITY OF DATA. IF ANY PRODUCT SHOULD BE DAMAGED OR LOST WHILE IN MOAT CUSTODY, MOAT LIABILITY WILL BE LIMITED TO THE COST OF REPAIR OR REPLACEMENT OF THE AFFECTED PRODUCT. OTHERWISE, MOAT LIABILITY FOR ANY AND ALL DAMAGE SHALL IN NO EVENT EXCEED THE PAYMENTS RECEIVED BY MOAT FOR SERVICES PROVIDED PURSUANT TO THESE TERMS. THE REMEDIES SET FORTH HEREIN SHALL BE YOUR SOLE AND EXCLUSIVE REMEDIES FOR ANY BREACH BY MOAT UNDER THESE TERMS AND CONDITIONS. MOAT IS NOT LIABLE FOR LOSS OR CORRUPTION OF DATA OR YOUR CONFIDENTIAL, PROPRIETARY OR PERSONAL INFORMATION OR REMOVABLE DATA. BEFORE YOU SEND IN YOUR PRODUCT FOR ANY REPAIR SERVICE, YOU SHOULD MAKE A BACKUP COPY OF YOUR DATA AND REMOVE ANY CONFIDENTIAL, PROPRIETARY OR PERSONAL INFORMATION AND REMOVABLE MEDIA.